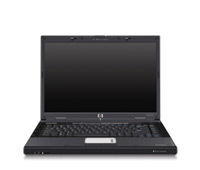 HP Pavilion dv5163cl is a multimedia home notebook PC and powered with Intel Centrino Duo mobile technology featuring Intel Core Duo processor T2300 at 1.66GHz and runs Microsoft Windows XP Media Center Edition. HP Pavilion dv5163cl features 15.4″ WXGA High-Definition BrightView Widescreen (1280 x 800) Display, 667MHz DDR Memory slots, SATA Hard Drive, LightScribe 8X DVD±RW and CD-RW Combo Drive with Double Layer Support, NVIDIA GeForce Go 7400 with 128MB discrete + 128MB shared, 10/100 Base-T Ethernet LAN, Altec Lansing sound system, Kensington MicroSaver lock slot. The laptop weighs 6.5 lbs. NotebookReview reviews HP Pavilion dv5163cl laptop computer which is a pre-configured system variant of the dv5000t series (HP uses very specific SKU numbers for pre-configured systems, while the dv5000t is a configurable system) and concludes that if you are a person who doesn’t do all that much gaming, and want to get a notebook that has good performance and bang for buck, I suggest you get it. It’s sturdy and has a pleasing look, has a LightScribe enabled DVD burner and has decent speakers too, making it a good contender in the multimedia rich notebook competition compartment.